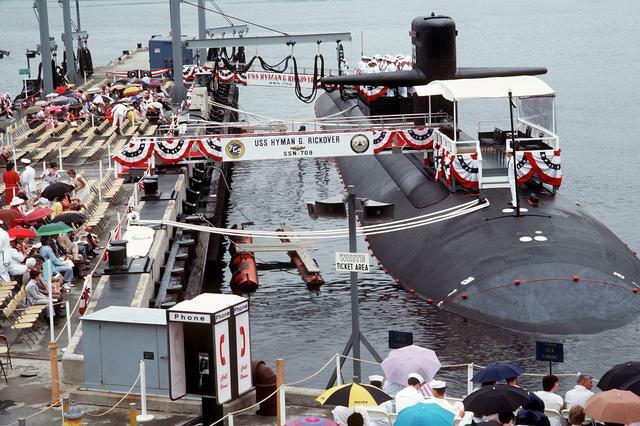 Los Angeles Class Attack Submarine: Laid down, 24 July 1981, at the Electric Boat Division of General Dynamics Corp., Groton, CT.; Launched, 27 August 1983; Commissioned, USS Hyman G. Rickover (SSN-709), 21 July 1984. 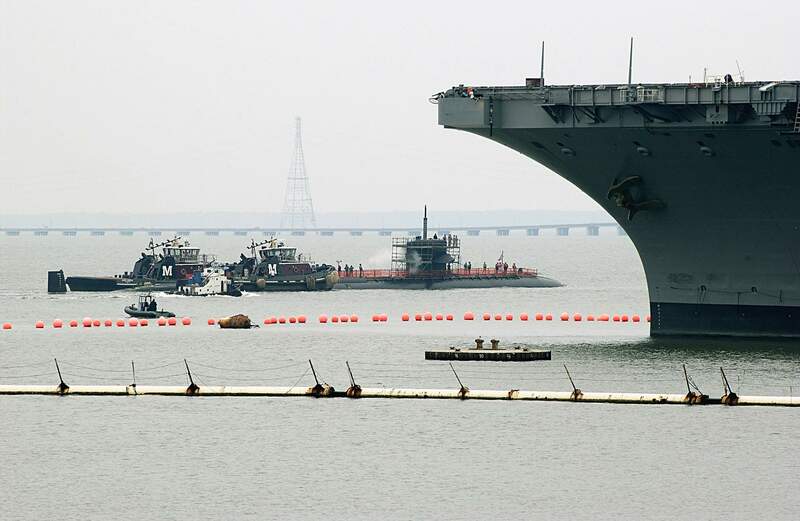 Hyman G. Rickover was inactivated on 14 December 2006, transported to Portsmouth Naval Shipyard in Kittery, Maine, in early 2009 for the year-long inactivation process. 482k Hyman G. Rickover. USN photo # 70134-10-65, contributed by Darryl L. Baker. 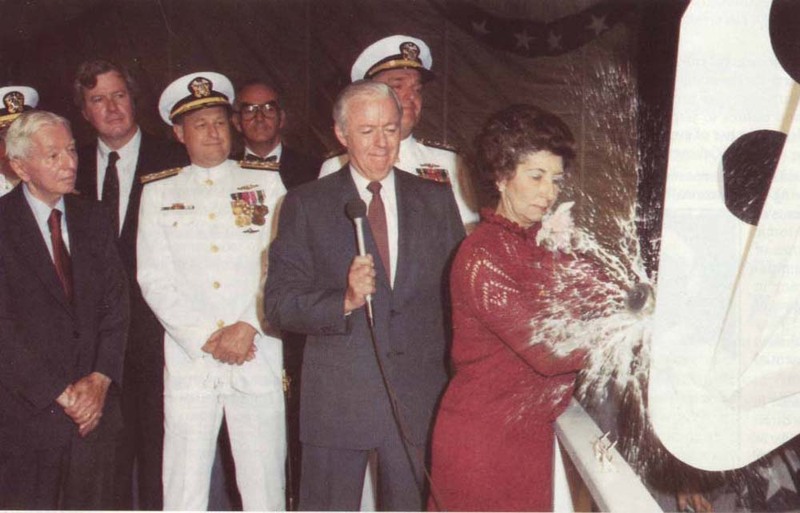 82k Mrs. Eleonore Ann Bednowicz Rickover does the honors for Hyman G. Rickover (SSN-709). Photo courtesy of Electric Boat via Dale Hargrave. 77k 6,000 tons of Hyman G. Rickover (SSN-709) slides into the waters of the Mystic River at Groton, CT., 27 August 1983. Courtesy of USNI. 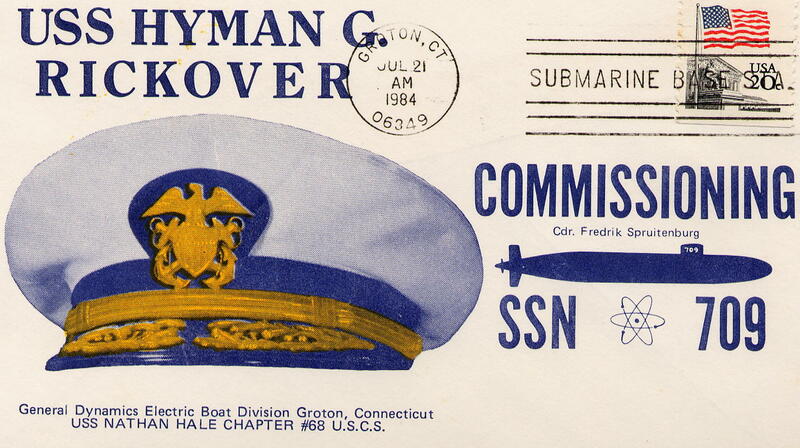 3.33k Seventeen photo PDF on the launching of the Hyman G. Rickover (SSN-709). USN photo courtesy of Scott Koen & ussnewyork.com. 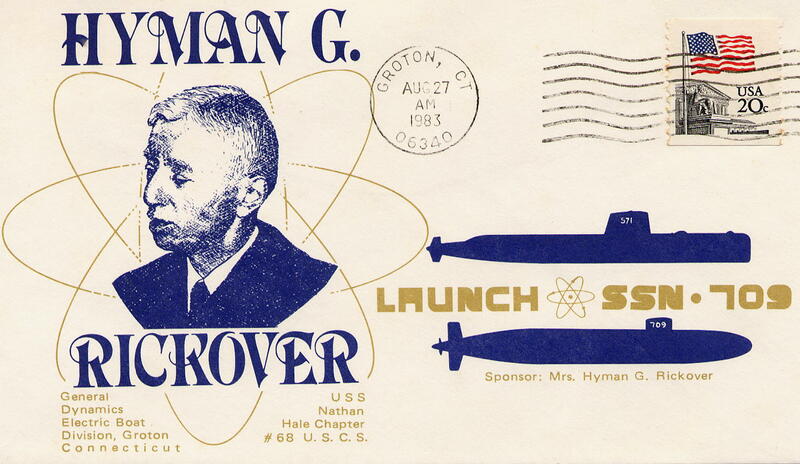 203k Launch cachet of the Hyman G. Rickover (SSN-709). USN photo courtesy of Scott Koen & ussnewyork.com. 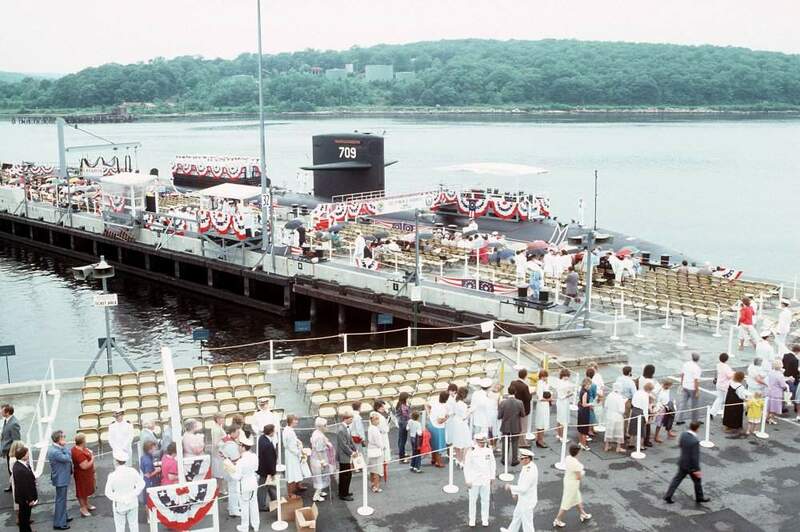 110k Guests arrive to attend the commissioning ceremony for the nuclear-powered attack submarine Hyman G. Rickover (SSN-709) at General Dynamics Electric Boat Division. USN photo # DN-ST-85-08113, by PH3 Joan Zopf, from the Department of Defense Still Media Collection, courtesy of dodmedia.osd.mil. 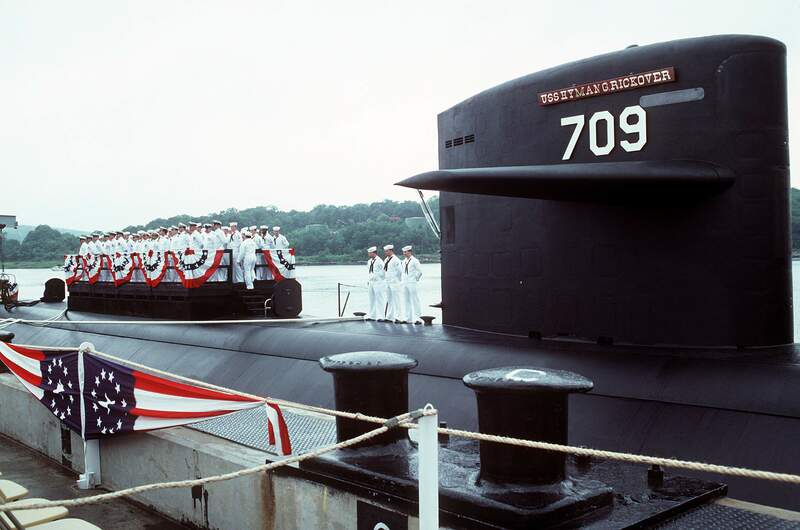 421k Crewmen stand in formation on the deck of the nuclear-powered attack submarine Hyman G. Rickover (SSN-709) during the ship's commissioning ceremony at General Dynamics Electric Boat Division, 21 July 1984. USN photo # DN-ST-85-08103, by PH3 Joan Zopf, from the Department of Defense Still Media Collection, courtesy of dodmedia.osd.mil. & submitted by Bill Gonyo. 75k Republican Charles E. Bennett, Democrat-Florida, speaks during the commissioning ceremony for the nuclear-powered attack submarine Hyman G. Rickover (SSN-709). Guests seated in the front row include, left to right: Vice Admiral Bernard Kauderer, Admiral Steven A. White, retired Admiral Hyman G. Rickover, Vice Admiral Nils R. Thunman and Captain Fredrik H.M. Spruitenburg. USN photo # DN-ST-85-08108, by PH3 Joan Zopf, from the Department of Defense Still Media Collection, courtesy of dodmedia.osd.mil. 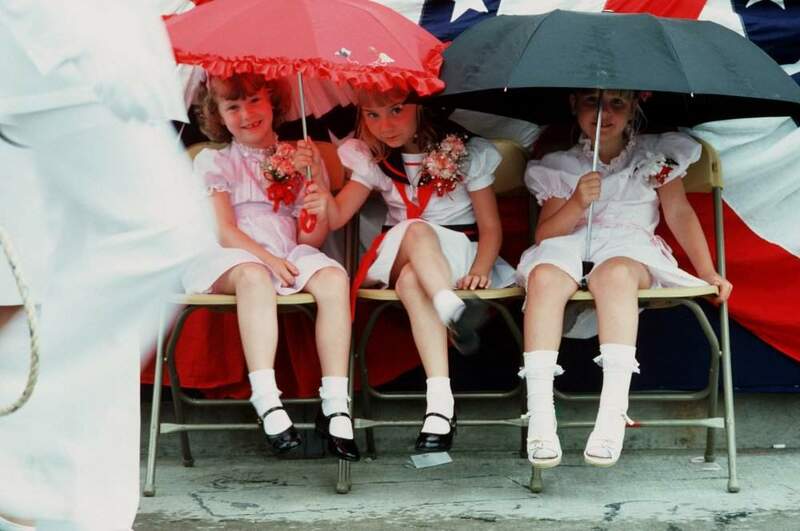 64k Three little girls attending the commissioning ceremony for the nuclear-powered attack submarine Hyman G. Rickover (SSN-709) use umbrellas to protect themselves from the rain. USN photo # DN-ST-85-08110, by PH3 Joan Zopf, from the Department of Defense Still Media Collection, courtesy of dodmedia.osd.mil. 207k A bow view of the Los Angeles class nuclear-powered attack submarine Hyman G. Rickover (SSN-709) as guests attend its commissioning ceremony at General Dynamics Electric Boat Division. USN photo # DN-ST-85-08111, by PH3 Joan Zopf, from the Department of Defense Still Media Collection, courtesy of dodmedia.osd.mil. 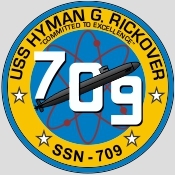 278k Commissioning cachet of the Hyman G. Rickover (SSN-709). USN photo courtesy of Scott Koen & ussnewyork.com. 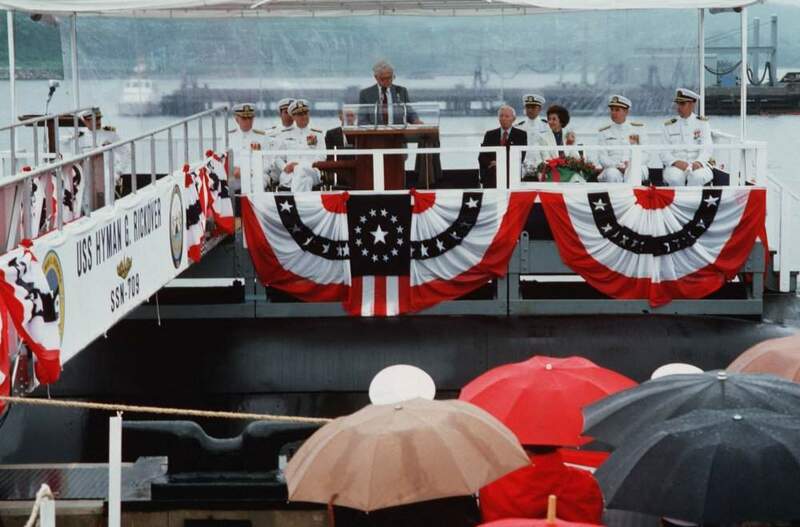 72k A sparse crowd waits in the rain during the commissioning of the Hyman G. Rickover (SSN-709), 21 July 1984 at Submarine Base, Groton, CT. Photo courtesy of USN. 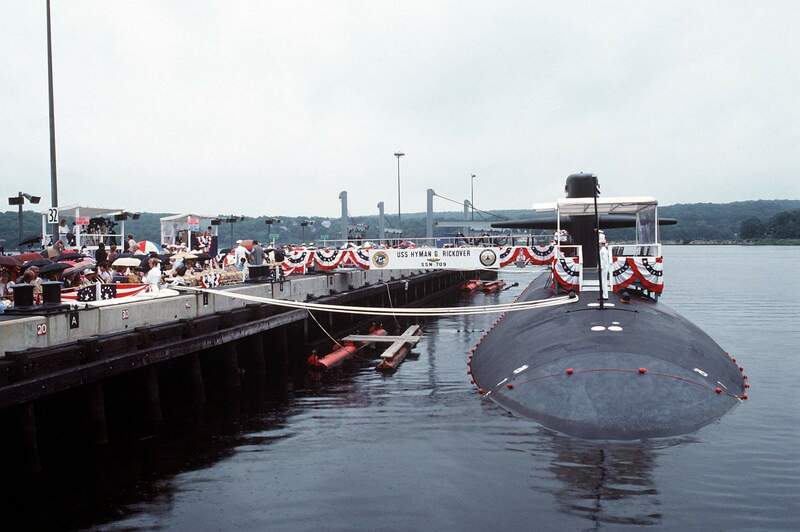 100k Front cover of the Commissioning Program for the Hyman G. Rickover (SSN-709), 21 July 1984 at Submarine Base, Groton, CT. Photo courtesy of Robert M. Cieri. 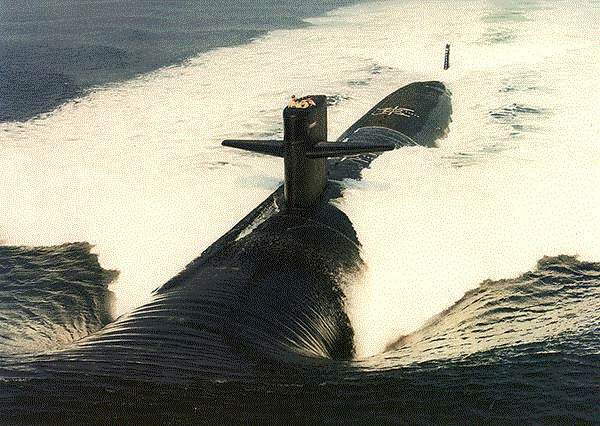 116k The Hyman G. Rickover (SSN-709) underway off the Atlantic coast, 31 July 1984. Official USN photo courtesy of Wendell Royce McLaughlin Jr.
196k Rear Adm. Jay M. Cohen commanded Hyman G. Rickover (SSN-709) from January 1985 to January 1988. 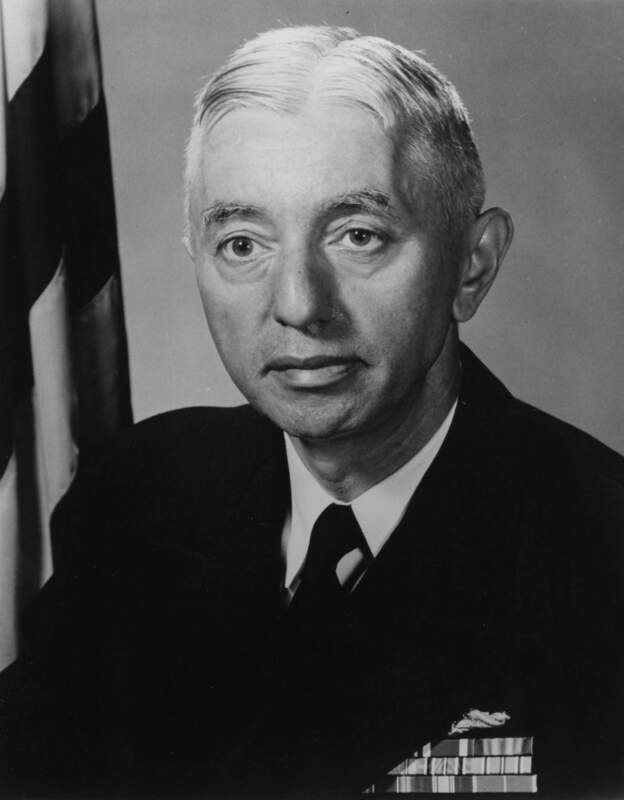 Under his command, Hyman G. Rickover was awarded a Navy Unit Commendation, a Meritorious Unit Commendation, the SIXTHFLT "Hook'em" Award for Anti Submarine Warfare excellence, CINCLANTFLT Golden Anchor Award for retention excellence, the COMSUBRON 8 Battle Efficiency "E" Award, and was designated the best Atlantic Fleet Attack Submarine for the Battenburg Cup. Photo # courtesy of Bill Gonyo. 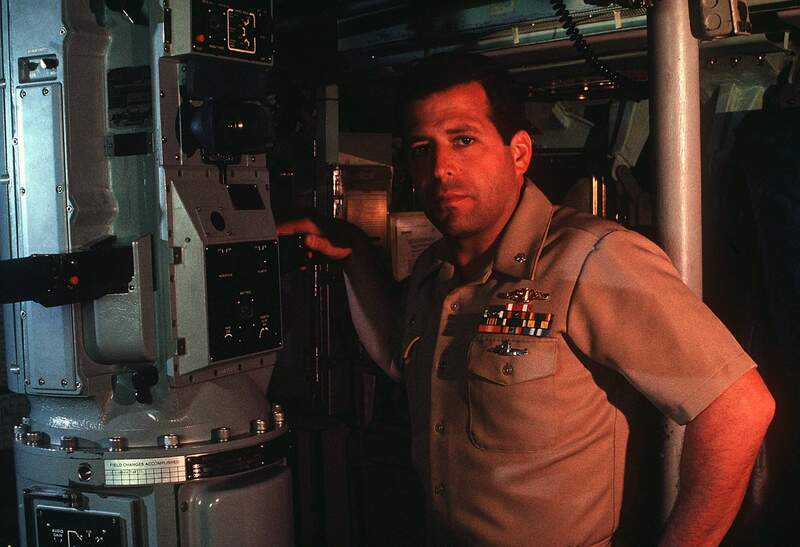 262k Commander B. S. Lemkin, commander of the nuclear-powered submarine Hyman G. Rickover (SSN-709), poses for a photograph next to the ship's periscope on 1 December 1988. USN photo # DN-ST-89-01964, by PH1 Mussi, from the Department of Defense Still Media Collection, courtesy of dodmedia.osd.mil. & submitted by Bill Gonyo. 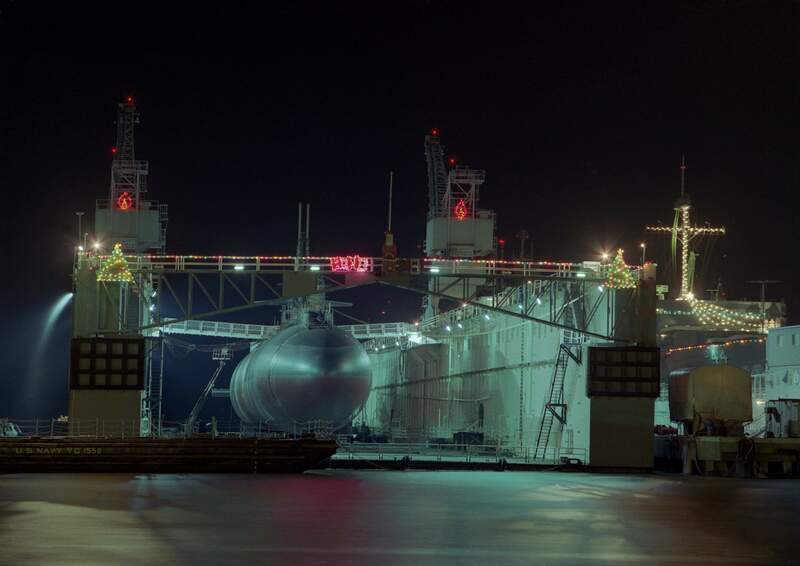 378k The nuclear-powered attack submarine Hyman G. Rickover (SSN-709) is positioned in the medium auxiliary floating dry dock Resolute (AFDM-10) while undergoing maintenance at Norfolk Naval Station, D&S piers on 18 December 1989. USN photo # DN-SC-90-04064, by PH2 Tracy Lee Didas, from the Department of Defense Still Media Collection, courtesy of dodmedia.osd.mil. 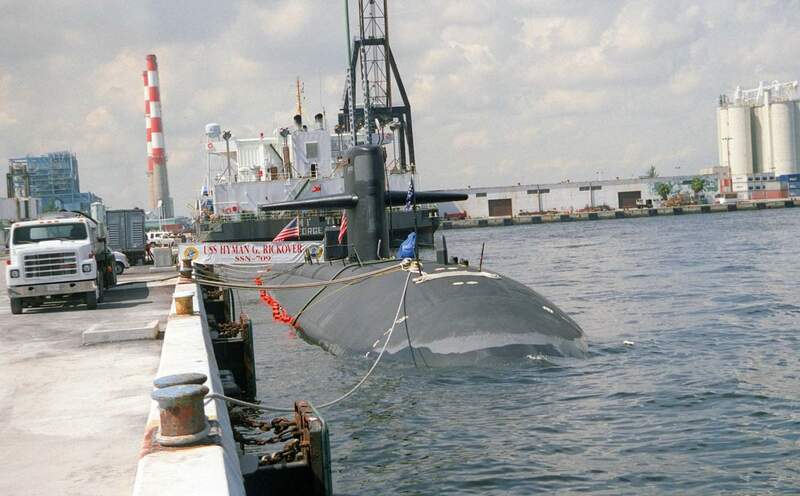 159k A starboard bow view of the nuclear-powered attack submarine Hyman G. Rickover (SSN-709) tied to a pier at Port Everglades on 11 October 1993. USN photo # DN-SC-94-00526, by OS2 John Bouvia, from the Department of Defense Still Media Collection, courtesy of dodmedia.osd.mil. 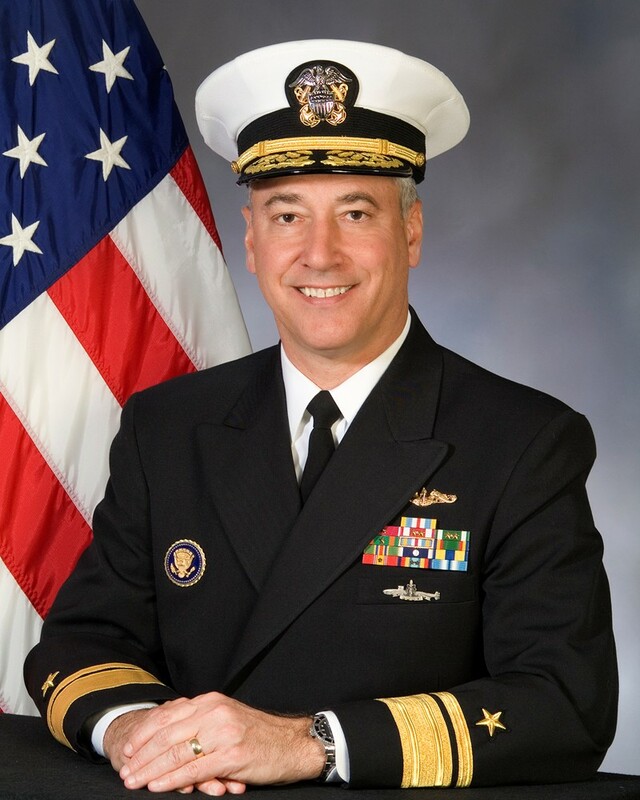 94k Vice Admiral John J. Donnelly was the Commanding Officer of the Hyman G. Rickover (SSN-709) from November 1991 to December 1994. 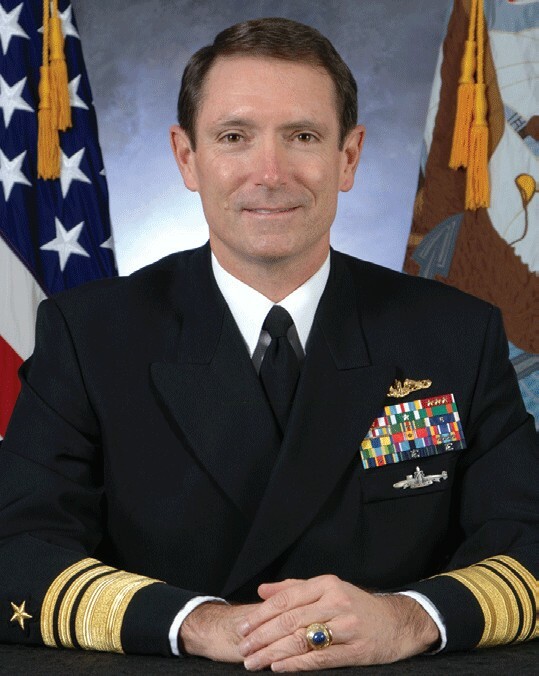 Official U.S. Navy portrait courtesy of Bill Gonyo. 177k Rear Adm. Walsh served as Commanding Officer of Hyman G. Rickover (SSN-709) from December 1994 through July 1997. While under his command, Hyman G. Rickover completed a North Atlantic deployment and was twice awarded the Submarine Squadron Eight Battle Efficiency "E" as well as the Golden Anchor Award. USN photo courtesy of cpf.navy.mil/bios/deputy. Photo courtesy of Bill Gonyo. 1.20k Twelve photo PDF Welcome Aboard the Hyman G. Rickover (SSN-709), circa 1996. USN photo courtesy of Scott Koen & ussnewyork.com. 59k Bow on view of the Hyman G. Rickover (SSN-709) underway, date and location unknown. USN photo from the National War College papers, courtesy of Bill Gonyo. 287k The Hyman G. Rickover (SSN-709) arrived at Newport News on 1 October 2004 for approximately five months of maintenance work. Work will include blasting and painting of the submarine�s internal and external tanks, removal and overhaul of various system valves, steering and diving gear inspection and repair, repairs to torpedo systems, and inspection and repairs to the sail, pressure and non-pressure hulls. 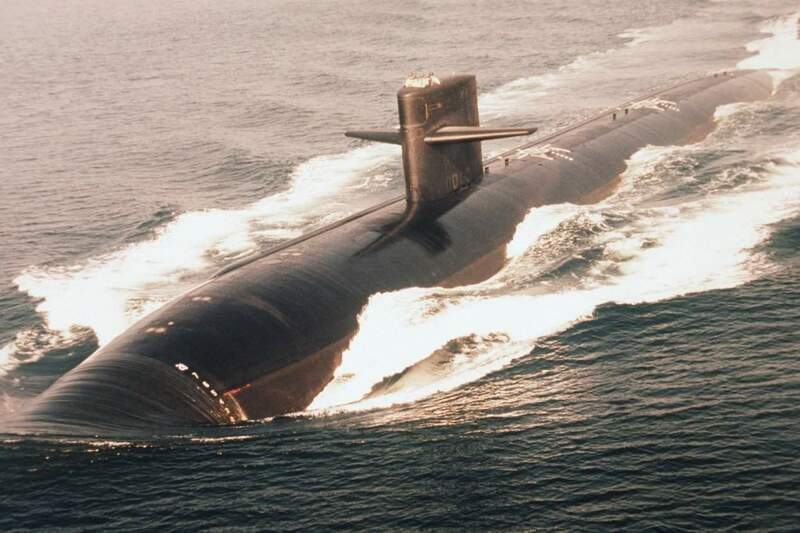 This is the second submarine availability awarded to the Newport News sector in the last two years. USN photo courtesy of Northrop Grumman Newport News, courtesy of Bill Gonyo. 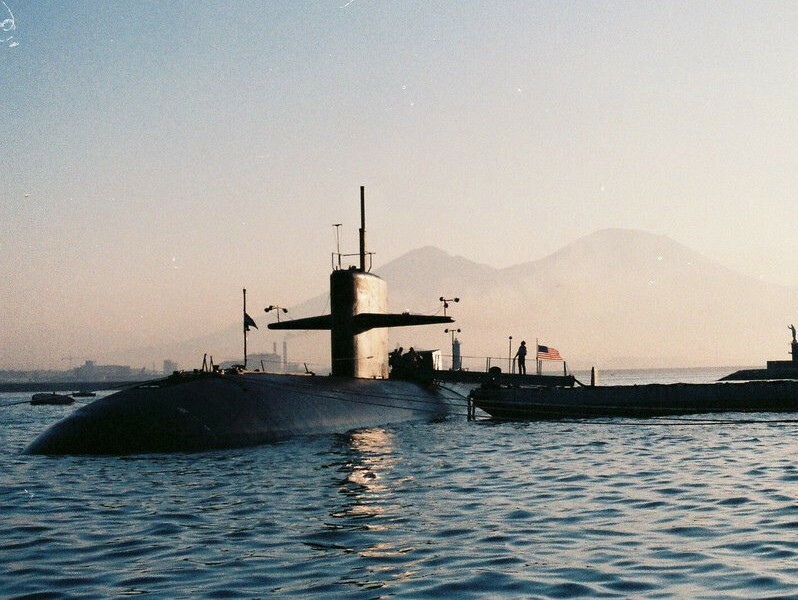 110k Hyman G. Rickover (SSN-709) at Naples, Italy during her last deployment. Photo courtesy of Bill Gonyo. 196k U.S. Navy Cmdr. 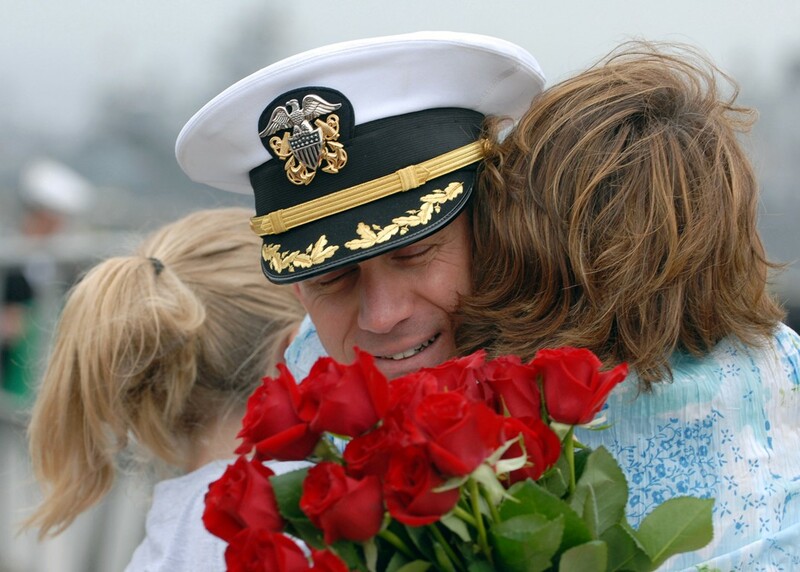 Robert Cosgriff, commanding officer, Hyman G. Rickover (SSN-709), embraces his family after returning to Naval Station Norfolk, Va., 11 October 2006, following a six-month deployment aboard the fast attack submarine. 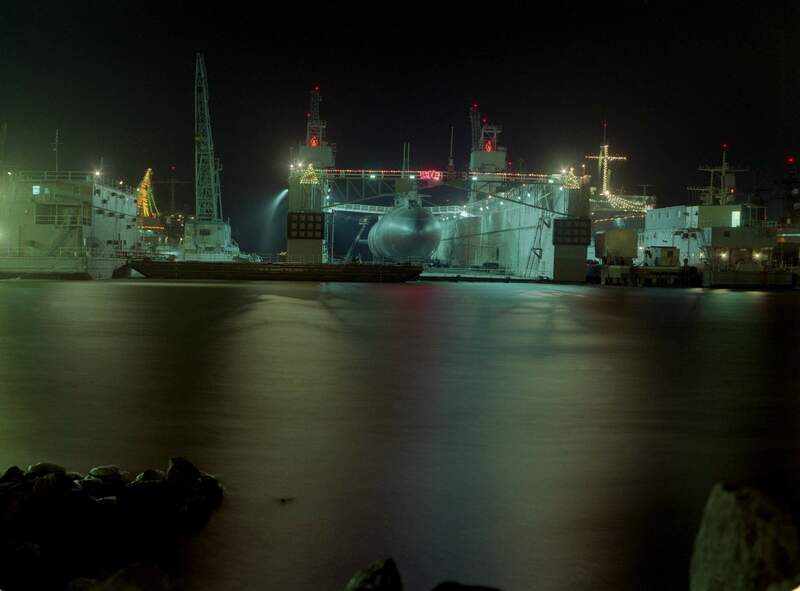 Photo # N-8655E-002 by Mass Communication Specialist Seaman Kelvin Edwards courtesy of Bill Gonyo. 353k Cmdr. Robert E. Cosgriff escorts Eleanor Rickover off the brow of Hyman G. Rickover (SSN-709) after taking command of the ship from Cmdr. 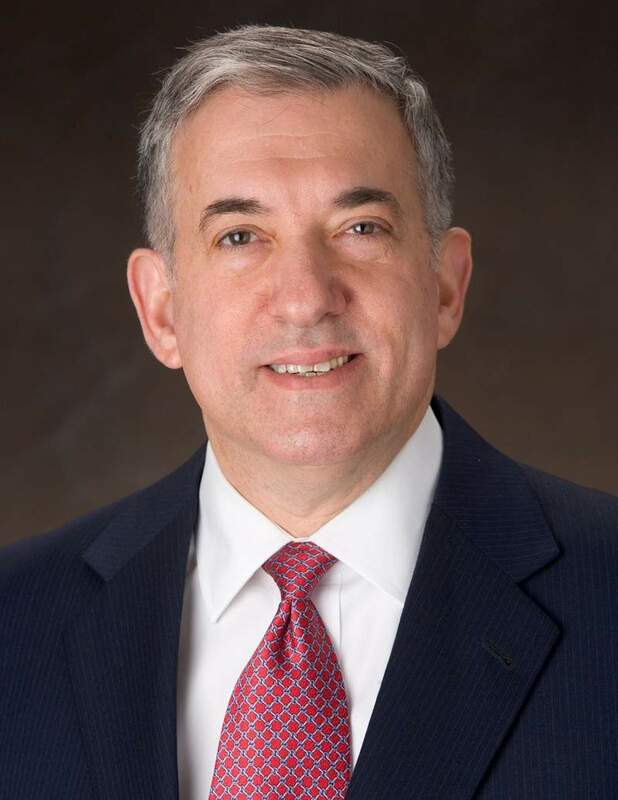 Kenneth L. Gray. 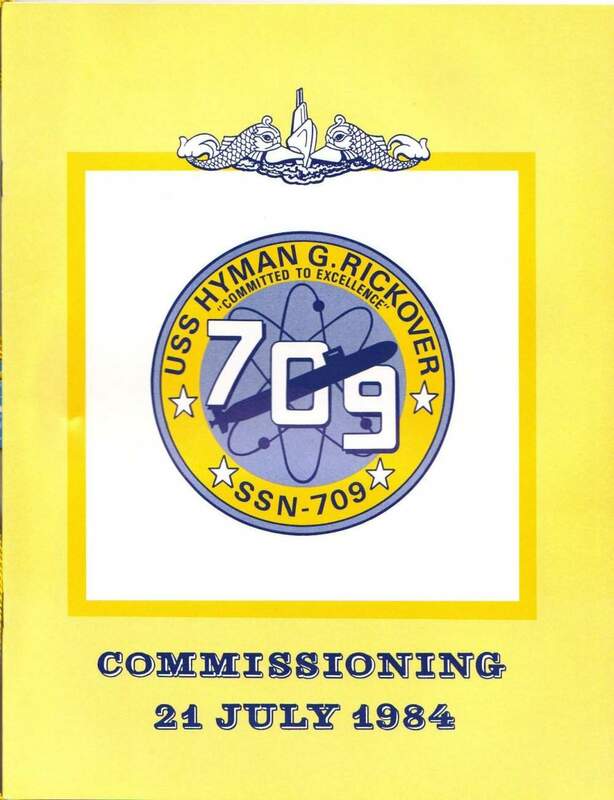 Commander Cosgriff commanded Hyman G. Rickover beginning August 2005 to June 15, 2007. During his tour, Hyman G. Rickover completed a North Atlantic deployment and was awarded the 2005 Tactical "T" and Supply Blue "E". He will have the distinction of driving the ship to its final resting place. On 14 December 2006, Hyman G. Rickover will decommission at Portsmouth Navy Shipyard, Kittery Maine. Just a short distance from where she was built in 1981. Photo # N-2820Z-002 from the Department of Defense Still Media Collection, courtesy of dodmedia.osd.mil. & submitted by Bill Gonyo. 315k Military Sealift Command rescue and salvage ship USNS Grapple (T-ARS-53) tows de-fueled, decommissioned nuclear submarine Hyman G. Rickover (SSN-709) to the Panama Canal on the first leg of a 10,000-mile tow from Portsmouth Naval Shipyard in Kittery, Maine, to Puget Sound Naval Shipyard and Intermediate Maintenance Facility in Bremerton, Wash. 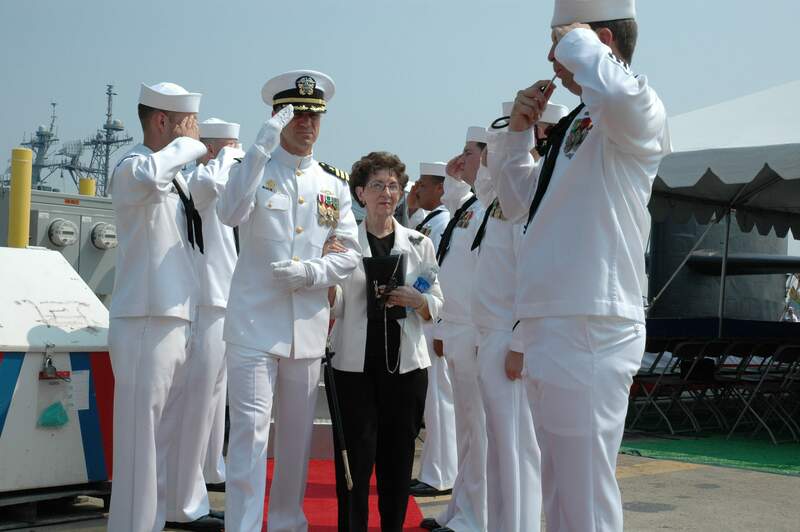 The ships departed Portsmouth 8 April 2009 and ex-Rickover arrived in Bremerton 30 May. 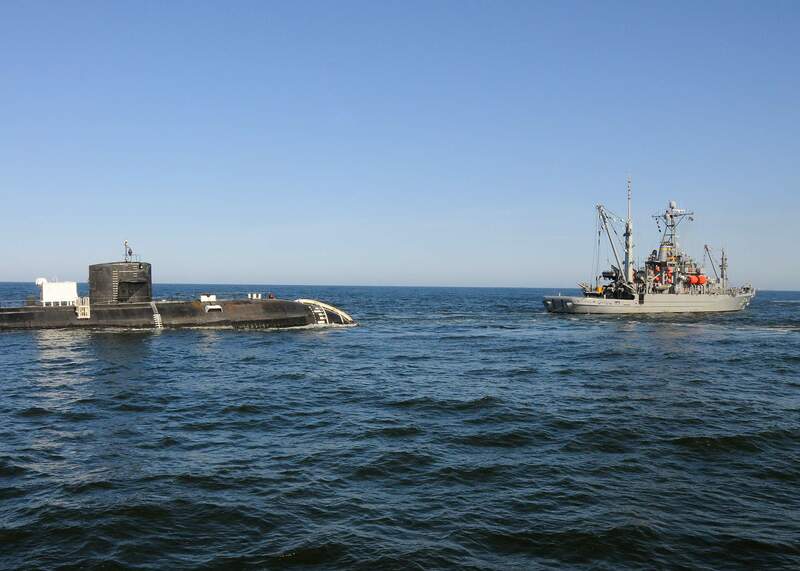 The submarine was towed through the Pacific by fleet ocean tug USNS Sioux (T-ATF-171). 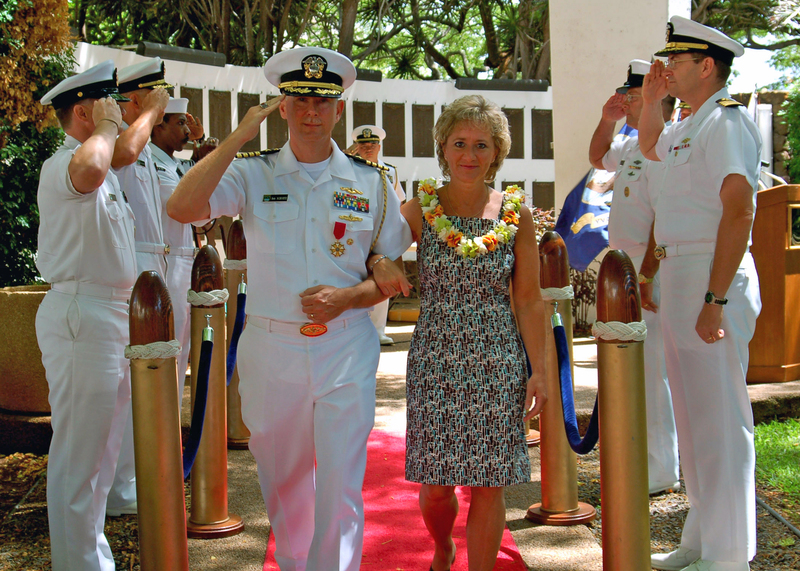 While in Bremerton, ex-Rickover will go through a dismantling program overseen by the Navy. USN photo courtesy of msc.navy.mi. via Gary Priolo & Lee Wahler. 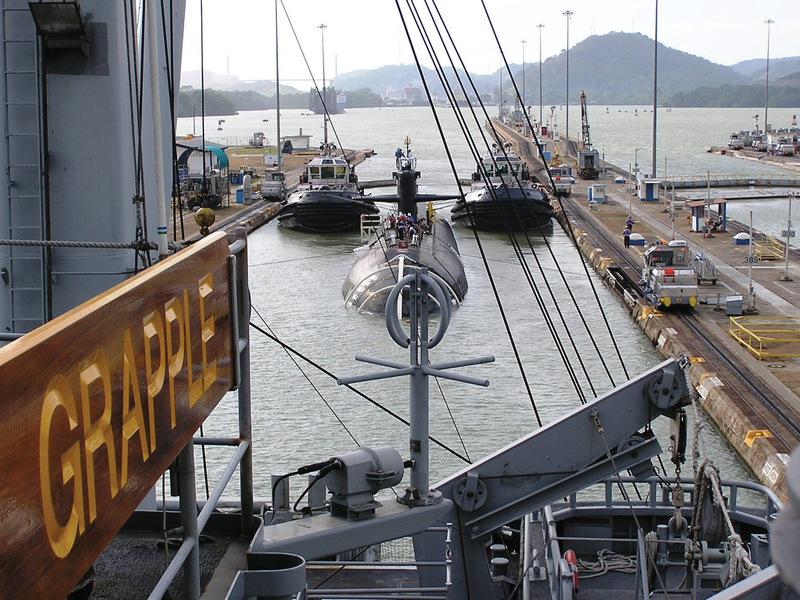 880k USNS Grapple (T-ARS-53) escorting the decommissioned nuclear-powered attack submarine ex-Hyman G. Rickover (SSN-709) through the Panama Canal in April 2008 after towing the submarine 3,600 miles from Kittery, ME. Photo courtesy of Gary Priolo via Robert Hurst. 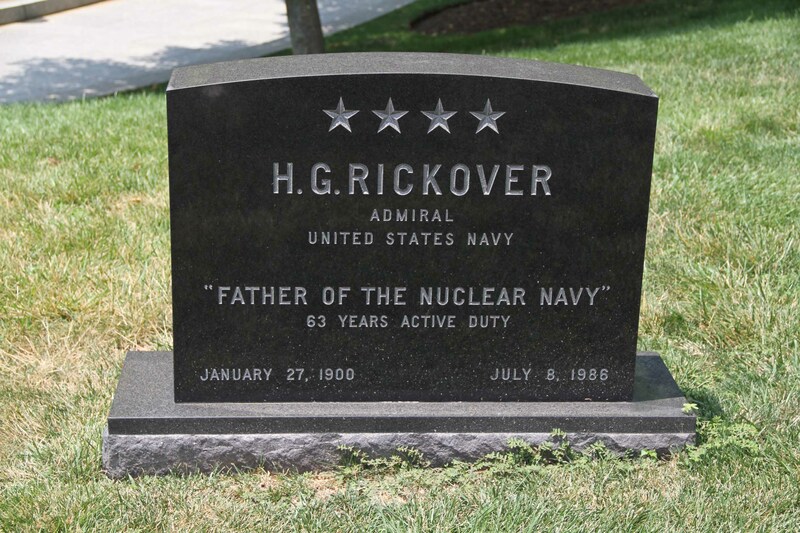 470k Hyman G. Rickover at Arlington cemetery. Photo courtesy of Dale Hargrave. 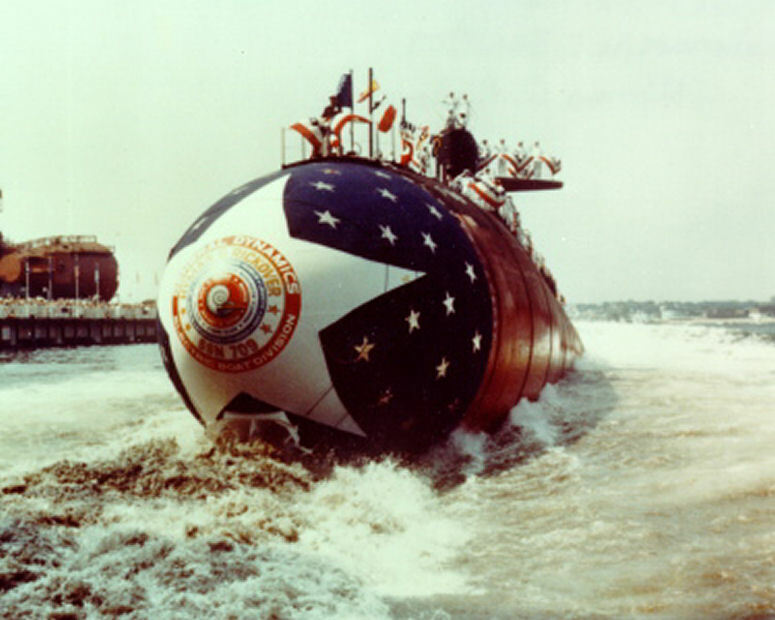 There is no DANFS History currently available for Hyman G. Rickover (SSN-709) at the Haze Gray & Underway Web Site, the main archive for the DANFS Online Project.